Telangana EAMCET 2 Medical Results 2016: The JNTUH (Jawaharlal Nehru Technological University, Hyderabad) conducted the TS EAMCET II Medical exam successfully on last Saturday (July 9, 2016). The University conducted the examination on all the Telangana districts by using various centers. Maximum of the students those who were all seeking the admission for MBBS, BDS were attended this EAMCET 2 exam and all of them now waiting for their exam results. As per the official notification, the result has declared on today June 13, 2016, at evening 5:00 PM. Scroll down and get the direct link of Telangana (TS) EAMCET 2 Medical results page here below. Jawaharlal Nehru Technological University is located in the Hyderabad, Telangana, India. Recently, the University conducted the TS EAMCET 2 Medical Entrance Examination. This Entrance Exam was conducted every year for the admission to the courses of MBBS and BDS. The University did this entrance exam for the academic year of 2016-17. The exam has held at the various center in all ten districts of Telangana. The JNTUH declared the result today on its official web portal in front of the Hon’ble Minister for Helth & Medical, Telangana State, Mr. Sri Charlakola Laxma Reddy. Totally, 50,000 students were approximately appeared in this TS EAMCET 2 Medical exam at 95 centers in all the ten districts of Telangana. This TS EAMCET 2 Medical rank will be decided based on the score of EAMCET for 75 percent and the intermediate marks as 25 percent. Kindly visit the above official direct link (Result Page) OR visit the Official Homepage. Enter the Hall Ticket number in the required field. 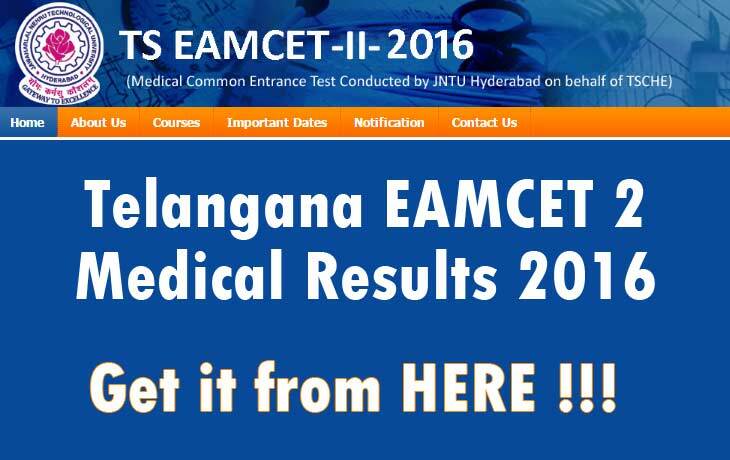 Check with your Results and Save/Print/Download the Telangana EAMCET 2 Medical Marks 2016 for future use. Stay tuned on WORLDHAB.com for more latest News and Updates and Like us on our FACEBOOK page to get up-to-date news.